Oh hi. I'm Rebecca. I used to blog in this space here. Sigh. I can't believe it's May already - is anyone else experiencing that?! I'm not even sure what I've done with 2014 so far. My life right now is kind of like a really stuffed burrito from Moe's...once you take a bite you can't put it down until it's done, otherwise it will all fall apart! I'm juggling so much stuff that I don't have time to stop and breathe, lest something fall by the wayside. But you know, I've been sewing a lot, and I have a backlog of like 6 projects that need to be blogged. And some of them are big. Luckily, I have the entire week off for the most relaxing sit-in-my-jammies-on-the-couch vacation. My first vacation time in a year. To say I'm excited is an understatement. 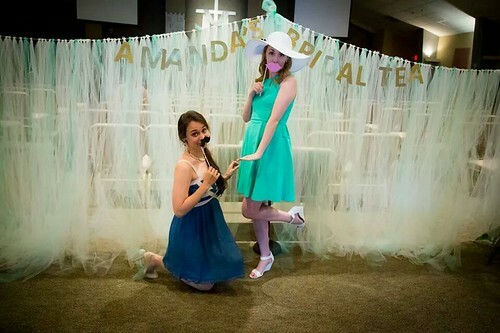 I thought I'd kick off my project backlog with something that is not necessarily sewing related, but I'm tickled about my effort, so...I'm a bridesmaid in a friend's wedding next week and recently the maid of honor and I hosted a huge bridal shower tea party for her. We invited 50 people, so we had to get crafty on pretty much everything, since both of us are clearly not rolling in money. Entry way - all the signs were chalkboard paper and all the centerpieces are tea pots or tea tins we owned or borrowed that were filled with flower arrangements the night before the event. 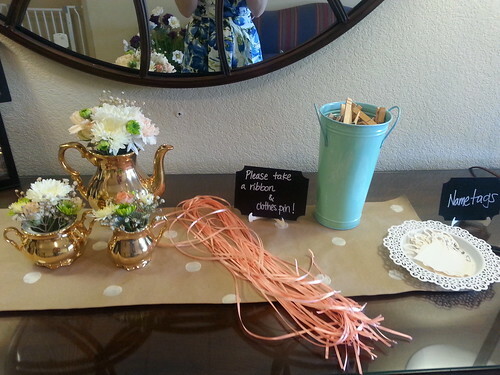 All the brown kraft paper table runners were polka dot stamped by yours truly with a champagne metallic paint. The tables were set with individual tea place settings of real china with a tea pot cut out of paper and threaded with honey straws [the favors!] and the individual's name. The lips and mustaches were cut out of paper as well and used for a game - they ended up being used as photo props too! I think it looked super nice when all the tea lights were lit and provided that soft romantic glow to the space. We had 6 tables, so lots of candlelight! 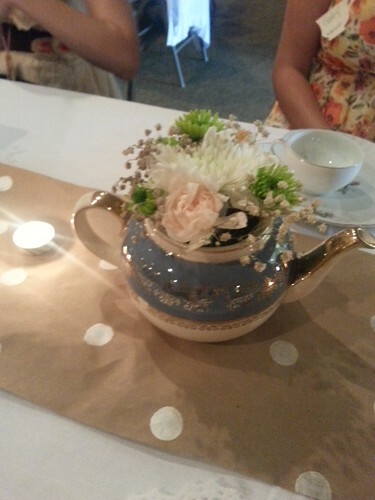 The color palette for the tea party was mint, ivory, and light peach, with gold accents. 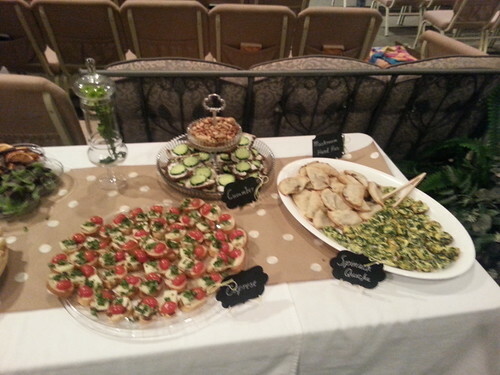 We ended up using pops of those green flowers in the centerpieces for a little bit of edge. We also spray painted the baby's breath gold. 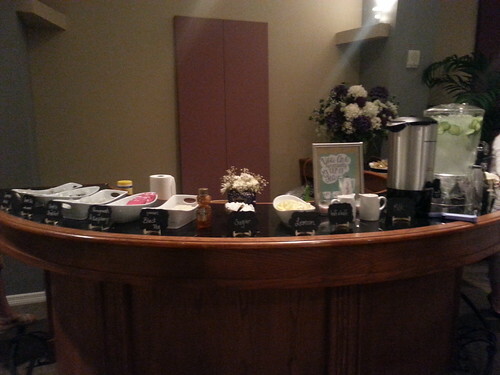 The guests got to enjoy a hot tea bar of several varieties of black, green, and herbal teas. I enjoyed a lovely green coconut variety. There was also cucumber water, lemonade, and blushberry iced tea. 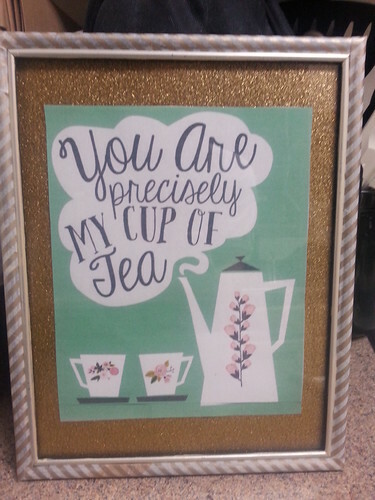 This print came from Etsy and was dressed up with some gold glitter cardstock. I had really wanted an ornate frame and was having the hardest time finding one, so I used a cheap black frame that I had and covered in in gold striped washi tape. This next sign is a platter from IKEA that I painted with chalkboard paint to sit on the gift table. I'm pretty excited to put it in my sewing room with some inspirational quote. The cohost and I made all the food the day before and day of. 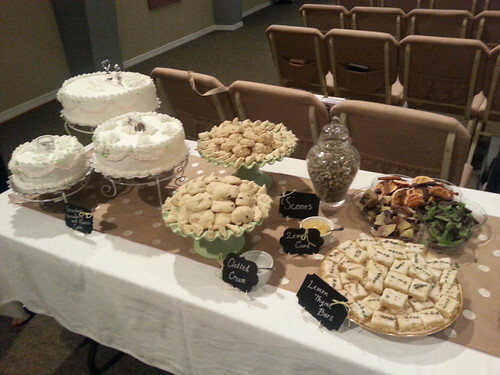 The bride is a vegetarian, which actually is perfectly suited for a tea party. Our menu consisted of mini spinach quiche and portabello mushroom and gouda hand-pies made by me for the hot food, cucumber and cream cheese finger sandwiches and caprese sandwiches that we made that morning, and then my cohost made blueberry, plain, and lemon ginger scones and lemon lavendar bars. We had a selection of nuts, dried fruit that we dipped in dark chocolate, and fruit-filled cakes made by the bride's grandmother. My greatest achievement for the bridal tea party was this monstrous tulle wall! 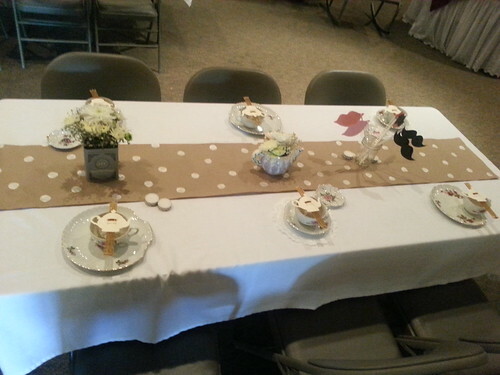 We held the event in a church [because of the number of people] and I really wanted to make our tea party space separate from the rest of the church to maintain the right atmosphere. So I got hundreds of yards of ivory and mint tulle online and cut strips to tie to fishing line. The wall ended up being 24 feet wide and 6 feet tall [it was strung between the food tables and the gift table]. I added the banner cut from more gold glitter cardstock and it ended up being a great room divider AND photo backdrop [that's my cohost on the left and the bride on the right]! All in all, a great day! I'm glad it's over with since it required a lot of planning and work, but it was pretty fun to pretend to be a party planner for a few weeks. Next up I have some quilts, clothing, and a tote bag, so stay tuned! wow, what an amazing shower you guys gave her!! And that tulle...holy smokes. Giiiirl. You did an amazing job! 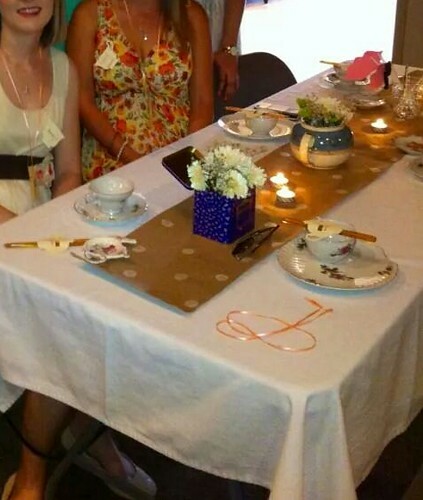 The table decor is brilliant (the stamped paper) and the tulle wall is ingenious. Your friend is lucky to have you :) Looking forward to seeing all of your projects! 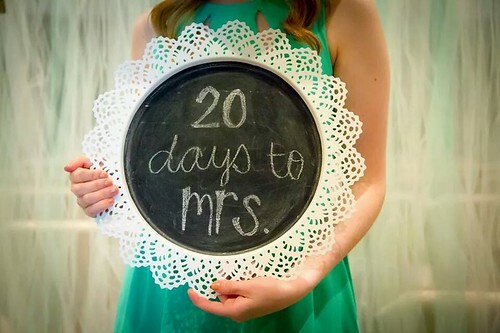 Any wedding progress on your end?